With the winter weather finally arriving in Colorado, I headed south to Shelf Road to wrap up a few projects I had bolted several years ago but (almost) forgotten about. Shelf is a really important crag to me. 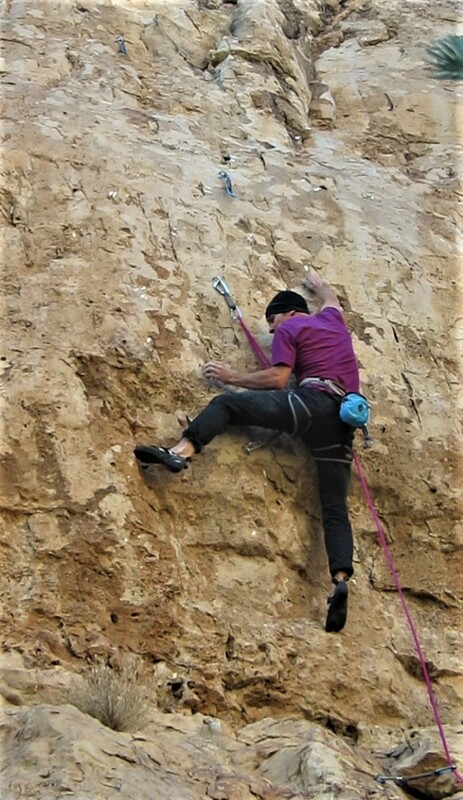 While I had done the odd First Ascent before I started climbing regularly at Shelf, that is where I really fell in love with vertical exploration and route development. Between dynos on Treble Huck, one of my new 5.13s at Shelf Road. Returning to the North Gym after a five year hiatus was nostalgic. 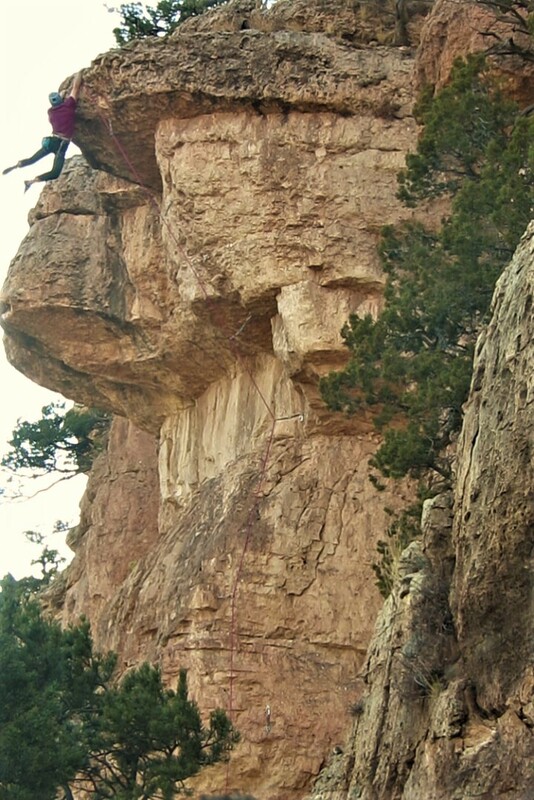 I bolted 20-some routes there in 2011, including establishing Shelf Road’s first 5.14, Apogee Pending. Most of my new routes are in pretty obscure locations, so I often wonder if anyone besides me will ever climb them. The North Gym is among the more obscure crags at Shelf, so when I looked through the comments on Mountain Project, I was encouraged to read of other peoples’ adventures on my creations. I was also stoked to see that some other people had started adding their own routes to the ample undeveloped rock in the area. On this trip I sent three new routes, all of which turned out quite a bit better than I expected. 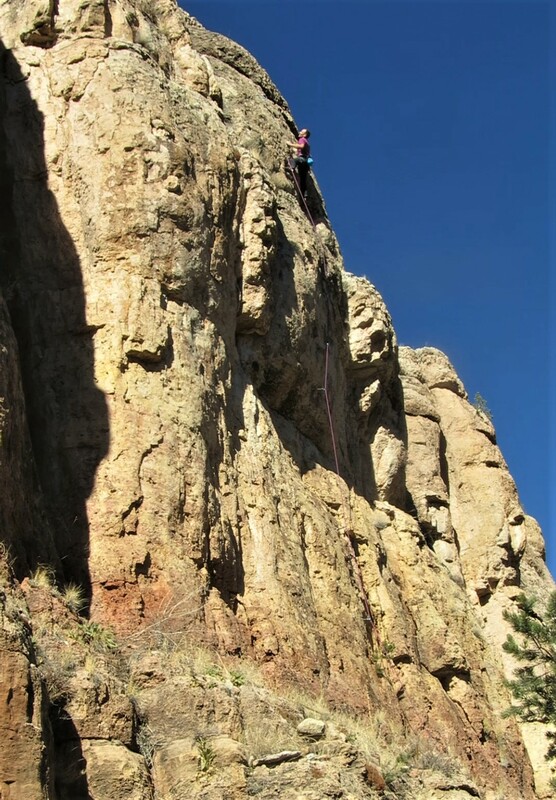 One of the great things about climbing primarily in Clear Creek Canyon is that when you go anywhere else the rock seems phenomenal by comparison. By the end of my infatuation with Shelf it seemed like I was running out of worthwhile options, and these three routes were bolted last because they seemed the most dubious. Five years later, with my new frame of reference, I can’t fathom my previous reservations. I never really had any doubts about the first route, Alpha Chino’s Chinos, but it’s isolated enough from the other walls that I feared it would be ignored. The rock is impeccable cream stone littered with pockets and edges. The movement is excellent, with a dynamic, sequential crux passing a 2-finger pocket on the gently overhanging panel at mid-height. I reckon it’s one of the two best 5.12s at The North Gym (along with Who Left the Fridge Open?). Clearing the final little bulge of Alpha Chino’s Chinos, 5.12b. The second route was squeezed in between two previously existing routes at The Tropical Wall. After climbing the adjacent lines for a photoshoot, I lowered down, imagined a potential sequence, and returned to bolt it soon after. It climbs a slightly overhanging bulge with a few diagonaling crimps that lead to a series of very thin sidepull slots. The rock is phenomenal in the crux—easily some of the best limestone at Shelf—though unfortunately the crux is rather short-lived. The rest of the line still offers excellent climbing on great stone, but it’s not hard enough to keep the outcome in doubt to the end (which is a hallmark of every truly classic route). Enjoying brilliant limestone in the crux of Satan’s Alley. At the time I bolted it I wasn’t sure if the line would go. My first time up I was stumped, straining to move between distant gastons. Eventually I figured out a big throw from an undercling that got me through the bulge, then it was just a matter of crimping and locking off like a maniac until I reached easier ground above. At 5.13c, Satan’s Alley is one of the harder lines at Shelf, though admittedly it lacks the imposing stature of the area’s other test-pieces. Near the end of my Shelf development spree I started noticing that many crags had really high capping roofs that offered the type of steep terrain that typically yields hard routes (but is rare at Shelf). The rock in this cap-layer is also quite a bit different (and in my opinion better quality) than the rest of Shelf’s limestone. It’s less fractured but also more featured, generally with lots of pockets. My third and final project for the trip was reminiscent of the rounded bulges and jutting roofs common to Wild Iris. It’s incredibly photogenic (and if I ever get a proper camera I might be able to back up that statement with some evidence), perched high above Four Mile Canyon with the snow-capped Sangre de Cristo mountains in the distance. I was eager to find out if the quality of the climbing matched the phenomenal setting. I was not disappointed. The climbing is everything the typical Shelf route is not. It shoots out a dramatically overhanging prow with toe cams, heel hooks and a series of big dynos. 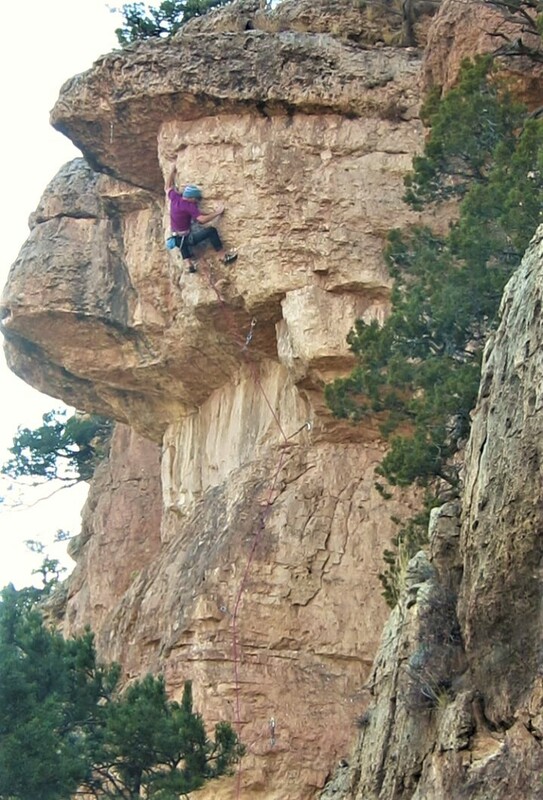 I’ve climbed just under half the routes at Shelf (the better half, for the most part), and I have to say the climbing on Treble Huck is arguably the most pure fun in the area. It’s gymnastic, wild, and dynamic. 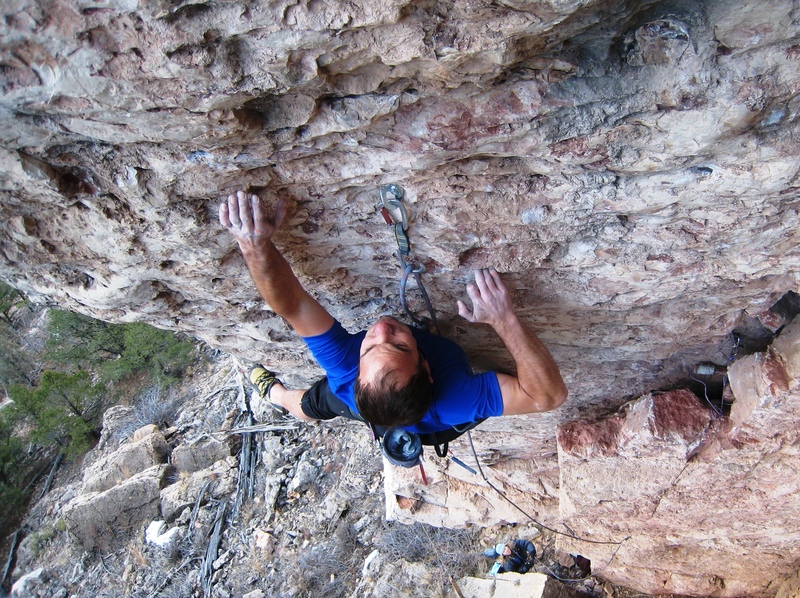 If you’re tired of standing on tiny footholds and tearing up your skin on half-pad crimps, this is the route for you. I think Shelf still has a lot of potential for routes of this kind, and I hope this route can help inspire some more exploration of the upper bands of limestone and the dramatic features they present. If only my legs were as skinny as they appear in this photo.